South Korea’s ongoing presidential scandal took another strange turn on Monday, after loyalists to disgraced President Park Geun-hye claimed that the newly formed conservative party’s logo is pro-Juche and North Korean ideology. The Liberty Korea Party, formerly known as Saenuri, renamed itself and announced a new start on Monday, seeking to distance itself from the scandal-ridden President. But in the eyes of Park loyalists, the party’s new red-torch flag evokes North Korea. “In Myung-jin, throw away the mask of the lie, and reveal your true ‘red’ identity,” a spokesperson for the biggest pro-Park group, Tankikuk said, criticizing Mr. In, the current interim leader of the party. Slightly taller than the Washington Monument in the U.S., Juche Tower in Pyongyang is the world’s tallest stone tower at 170 meters high. 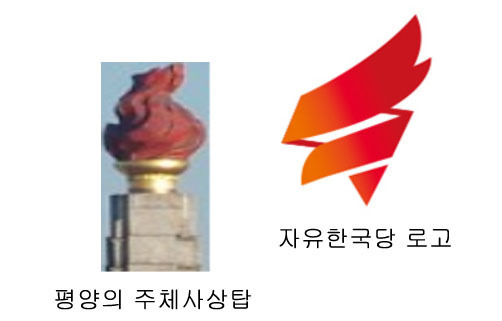 Finished on April 15, 1982, to celebrate Kim Il Sung’s 70th birthday, the torch on top is currently used as a logo for the DPRK’s state-run Korea Central News Agency (KCNA). “We’ve been fed up so far, but we can no longer tolerate you after seeing this logo for the new party… (In Myung-jin) go to North Korea,” the statement said. “Was our Saenuri Party absorbed by the North Korean puppet regime’s Workers’ Party of Korea (WPK)?” one Parksamo (a Korean acronym for a Park loyalist) commented on the online statement. “Drag In Myeong-jin out!” another member wrote. The accusations have their roots in leader In Myung-jin’s long history of participating in NGO activities sending humanitarian aid to the North, an act often seen as “helping the regime” by conservatives. 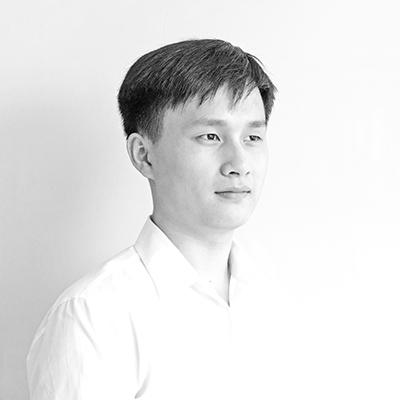 As the founding member of the NGO Korean Sharing Movement, which has been active for more than two decades, In was awarded last year for his long-time efforts for unification and the reconciliation between the South and the North. But it was Park loyalists’ claims that made the headlines in South Korea outlets on Tuesday morning, claims which quickly drew responses from other right-wing figures as well. “The ‘torch’ in North Korea de facto symbolizes Kim Il Sung,” Byun Hee-jae from MediaWatch said. 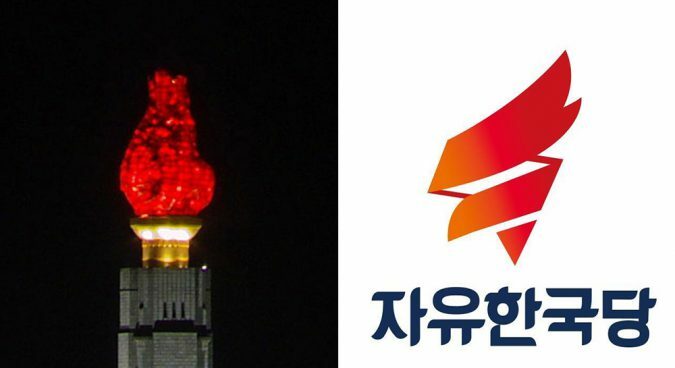 “The red torch… this is no better than the party becoming the sub-branch to the North’s WPK,” Shin Dong-wook, a representative of the Republican Party, a minor right-wing party, said. Out of the 299 seats in the South Korean National Assembly, Liberty Korea Party holds 94 seats, after a few dozen lawmakers split from the former Saenuri Party to form the alternative center-right Barun Party in December last year.